~2206 (1147 are living) people have been invested at the level of Officer – the second highest level. ~In the field of sport – the numbers are pretty slim. There are 205 Canadians (137 are still living) who have received the Order of Canada who’s background is sport. Only 59 (46 living) have been given the Order at the level of Officer. I am now one of the 46. When I look at how few people have received this honour I was blown away, particular with respect to the number of people in sport. It shows that this award is given out to people who are more than just great at their sport, it acknowledges those who give back and build our community and country. I am very proud of the work I’ve done like that for so many groups. I believe there are a number of my Olympic peers who are very worthy of this honour, for what they have done in and out of sport – so many of them give back daily in such a variety of amazing ways. I have no hesitation when I’m asked what athletes do to build our nation, and I’m proud that I have been recognized as someone who has, and continues to, give back. Published on Fri Jun 28 2013—Actor Paul Gross, former P.E.I. premier Alexander Campbell and legendary rocker Ronnie Hawkins are among 74 appointments to the Order of Canada announced Friday. The three are among 34 people named as officers of the order, the second-highest grade. Hawkins’ appointment is honorary because although he has lived in Canada for five decades, he remains an American citizen. Others named as officers include Olympic rower Marnie McBean. She won a pair of gold medals in Barcelona in 1992 and added a third in Atlanta in 1996. Toronto filmmaker Deepa Mehta was appointed an officer for her contributions as a groundbreaking screenwriter, director and producer. Marnie McBean has translated her own success into helping others. 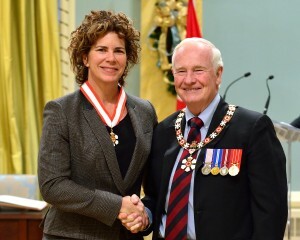 As a member of Canada’s rowing team, she won numerous national and international titles and is one of only two Canadians to win three summer Olympic gold medals. She now channels her energy and determination into mentoring our Olympians, helping them turn their potential into performance. As an ambassador for Right to Play, Fast and Female, and Plan Canada’s “Because I am a Girl” campaign, she continues to inspire and build confidence in young women. This entry was posted in Marnie in the News and tagged Marnie McBean Order of Canada by Marnie. Bookmark the permalink.